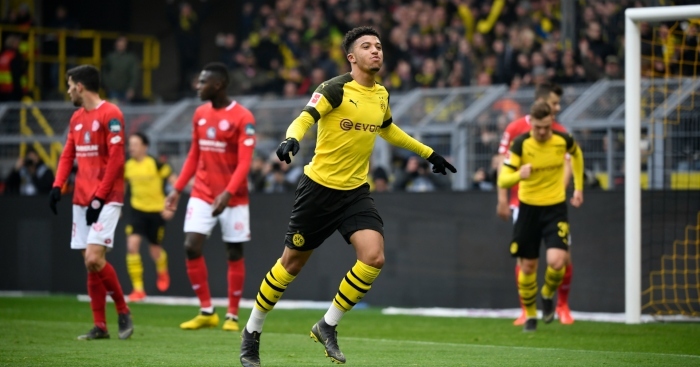 Jadon Sancho continued his remarkable form for Borussia Dortmund this season with a match-winning brace in a 2-1 victory against Mainz at the weekend. After breaking into Dortmund’s first team in the second half of last season, Sancho has enjoyed a ludicrous rise, becoming a mainstay of the starting XI and making his senior England debut. We’ve taken a look at six statistics which sum up just how impressive Sancho’s campaign has been. – Sancho is the only under-23 player in Europe’s five major leagues to register double figures for goals (10) and assists (13) this season. – Only three other players – Lionel Messi, Eden Hazard and Pablo Sarabia – have managed to reach double figures in both goals and assists in Europe’s big five leagues. Sancho is the youngest of the quartet by eight years. – Sancho is the first player to provide 10+ goals and assists in a single Bundesliga season since 2015-16 when Raffael and Henrikh Mkhitaryan both reached the mark. – Sancho and Raheem Sterling are the only two English players to be directly involved in 22+ goals in Europe’s five major leagues this season. – With his brace at the weekend, Sancho joined Mario Gotze as the only teenager to score 10+ Bundesliga goals in a single season for Borussia Dortmund. – Sancho’s goals and assists have been worth 21 points to Dortmund this season. Nine of his 11 goals have come in games which were draws or decided by a single goal.